Sticky Fingers is an unofficial publication for the rock band The Rolling Stones. 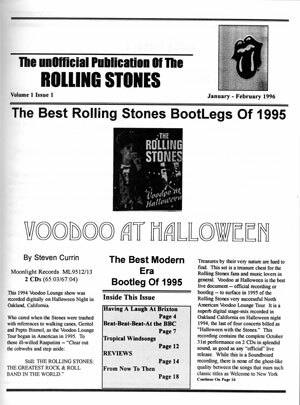 Started in 1996, it served as a subscription newsletter for fans of The Rolling Stones who also collected live bootleg recordings of the band's music. 1. ``Jumpin' Jack Flash'': Bootlegged from the ``Gimme Shelter'' 1969 Altamont concert film, this alternate version features a fantastic lead guitar break from Taylor. It's the 1969 version of the Stones without horns and sidemen. 2. ``Roll Over Beethoven'': From the 1970 European tour, this Chuck Berry favorite was last covered by the band in '65 and hasn't been picked up since this trek. 3. ``Stray Cat Blues'': From the 1971 farewell to Britain tour, before the band moved to France for tax reason, this was recorded at Leeds University with lots of inventive lead work from Taylor. 4. ``Love in Vain'': An incredible version of this Delta blues classic taped during the 1972 tour, with Taylor's fluid, bluesy guitar at its very best. 5. ``You Can't Always Get What You Want'': Taped in Europe in 1973, a great 12-minute performance of a great Stones song with a memorable sax solo by Bobby Keys. 6. ``Wild Horses'': A song never played during the Taylor years, this marks the start of the Ron Wood era of the Stones. Taped in 1975 by an audience member in Baton Rouge, La., tour keyboardist Billy Preston's chimes ring in the background during a unique version of this Stones country classic. 7. ``Brown Sugar'': Bootlegged from a 1978 radio broadcast, this performance features an energetic audience sing-along on the chorus. 8. ``Paint It Black'': With backup singers, horn section and extra musicians, this 1989 track reveals an energized Stones back on the road. 9. ``Gimme Shelter'': A fantastic, extended version from 1995, taped in Europe for TV broadcast. 10. ``Let It Bleed'': Taped on the secondary smaller stage at a Chicago venue in 1997, this is a solid country rave-up. -Sticky Fingers Volume I 1996, put together by John F. Carr. It is in excellent condition, no visible marks or stains on it. 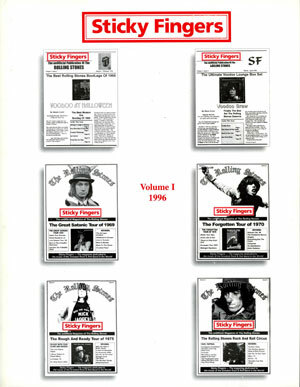 The magazine includes the first 6 issues of Sticky Fingers Magazine that were published in 1996. -Sticky Fingers IV issues 3, 4, 5 and 6. Single issues from 1999 and 2000. From a file folder labeled “Letters—1996.” The file contains various correspondences between John F. Carr and others regarding business as well as Sticky Fingers. There are also handwritten notes from friends. Most of the letters are dated 1996, as the file’s label indicates, however there are some exceptions that are dated 1997. From a file folder labeled “Letters—1999.” The contents of the file are correspondences that relate almost exclusively to Sticky Fingers. The file also includes some flyers for Sticky Fingers and newspaper clippings. The contents of a folder labeled “Letters-Early.” The letters are written by subscribers to Sticky Fingers, and cover a variety of subjects ranging from subscriptions and renewals to suggestions for content and improvement. The letter range in date from 1996 to 1998. A copy of the September 2007 issue of Mojo Magazine, which contains a Rolling Stones anniversary special. 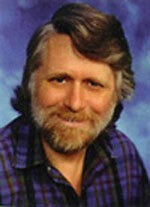 The contents of a file labeled “SFM Letters.” The file contains letters written to Carr by readers of Sticky Fingers. The approximate date range of the letters is 1998-1999. The contents of a file folder labeled “Video Rewind.” The file contains letters written to Carr by readers of Sticky Fingers. The approximate date range of the letters is 1996-1997. The contents of a file folder labeled “Sticky Fingers.” The file contains letters written to Carr by readers of Sticky Fingers. Some of these letters concern Carr’s decision to end to publication of the magazine. The approximate date range of the letters is 1996-2001. A collection of letters written to Carr by readers of Sticky Fingers Magazine. Some of the letters are handwritten; others are typed or printed out emails. The letters range in date from 2000 to 2001.